Kansas is home to the nation’s most famous gravel road race, the Dirty Kanza, so it is perhaps fitting that it does a poor job of ensuring that there are safe paved areas for people to bike. 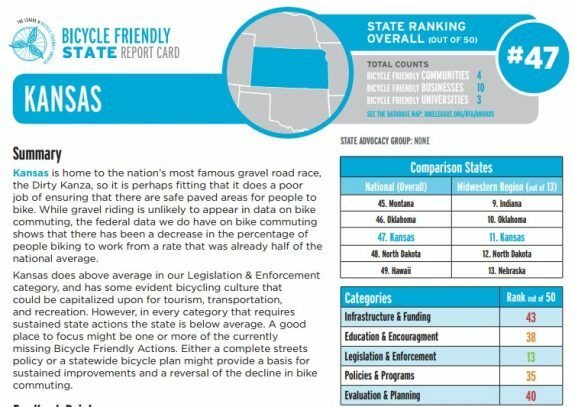 Kansas does above average in our Legislation & Enforcement category, and has some evident bicycling culture that could be capitalized upon for tourism, transportation, and recreation. However, in every category that requires sustained state actions the state is below average. Our last statewide bike/ped plan was completed in 1995. The fundamental assumptions of the world have shifted a great deal in the last 2+ decades, yet we’re still continuing on as if nothing has changed in health, in transportation, in recreation and tourism. Kansas no longer has a statewide bike/ped advocacy organization. While there are some strong organizations that focus on particular cities, there is no organization that advocates on bicycling issues across the state. The state’s mandatory sidepath law remains a thorn in our side, being both legally obsolete and morally reprehensible. Kansas allocates zero state funding for bicycling planning and infrastructure. The only funds available for bike/ped projects come from Federal dollars. Our #47 ranking is actually a tiny step up from 2015, when we were #48. When the Bicycle Friendly State rankings began, in 2008, Kansas was ranked #25. In 2009, we dropped to #33. In 2010, we jumped way up to #13. In 2011, we slipped to #23. 2012 saw a big drop to #34. In 2013 well fell again, to #40. In 2014, Kansas was at #46. The #48 in 2015. Now #47.